Sadly, it is highly likely that psychological torture is committed by governments worldwide and yet, notwithstanding the serious moral questions that this disturbing and elusive concept raises, and research in the area so limited, there is no operational or legal definition. 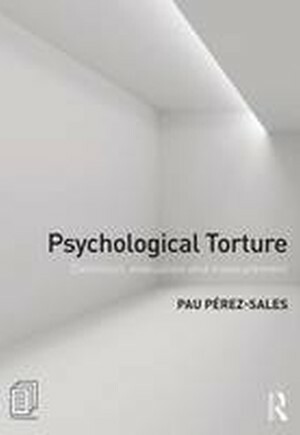 This pioneering new book provides the first scientific definition and instrument to measure what it means to be tortured psychologically, as well as how allegations of psychological torture can be judged. Ground in cross-disciplinary research across psychology, anthropology, ethics, philosophy, law and medicine, the book is a tour de force which analyses the legal framework in which psychological torture can exist, the harrowing effects it can have on those who have experienced it, and the motivations and identities of those who perpetrate it. Integrating the voices both of those who have experienced torture as well as those who have committed it, the book defines what we mean by psychological torture, its aims and effects, as well as the moral and ethical debates in which it operates. Finally, the book builds on the Istanbul Protocol to provide a comprehensive new framework, including practical scales, that enables us to accurately measure psychological torture for the first time. This is an important and much-needed overview and analysis of an issue that many governments have sought to sweep under the carpet. Its accessibility and range of coverage make it essential reading not only for psychologists and psychiatrists interested in this field, but also human rights organizations, lawyers and the wider international community.